StableHost has just announced the brand new location opening in Singapore. So that, for now it has 4 datacenters: Phoenix, Chicago, Amsterdam and Singapore. Moreover, this provider also has coupon codes for all of their hosting plans. A good hosting plan starts at only $1.75/month. 5JW0EJ5VCG – 50% off Any Shared Hosting Plan for life of your account. BigRock is now launching a new coupon code, which can help to save up to 50% off on all hosting products here. Available in the next 2 days – May 31st and June 1st 2017, using the code below when you purchase Shared Hosting, Reseller Hosting, Cloud Hosting or Dedicated Server at BigRock to save your money. A single domain hosting plan – Starter Shared Hosting (20GB Space , 100GB Transfer , 5 Accounts) now starts at just Rs 29.5 ~ $0.46/month. ***The deal is for both new and existing customers but limited only 1 redemption per customer. - Valid for Indian customers only. - Not applicable on renewals. - PayPal and Visa/Master Card accepted. Besides Vultr, DigitalOcean, Linode is one of the most famous cloud server providers all over the world with 8 datacenters: Atlanta (Georgia, USA), Dallas (Texas, USA), Fremont (California, USA), Newark (New Jersey, USA), London (United Kingdom), Tokyo (Japan), Singapore and Frankfurt (Germany). Linode services have many incredible reviews with a high-quality cloud server, nice, fast and helpful support. If you have never tried Linode before, the company gives you some promo code, up to $20 free credit to test their services. Simply sign up a new account following this link, then use one of the coupon codes below, you will receive the credit for free. Note: The free credit gift codes are valid for new customers only. Linode do not accept PayPal so you can make your payment with Credit Card. Let’s take advantage of this chance! Besides GoDaddy, Namecheap, Domain.com is also a popular domain/hosting provider that should be mentioned. It has discount coupons all the time (around 10% – 30%) on the total of the payment amount. Sometimes, Domain.com offers huge flash sale – standard domain names cost only from less than $1/year. I recommend that you should register an account in advance at Domain.com. It’ll help you to save more time and get the deals easier. There is no limit on the number of domain purchase and available up to 5-year term with all coupon codes above. Applied to all kinds of domain. Unlimited usage! Applied to all kind of domain. Unlimited usage! Domain.com accepts both Debit/Credit Card and Paypal. 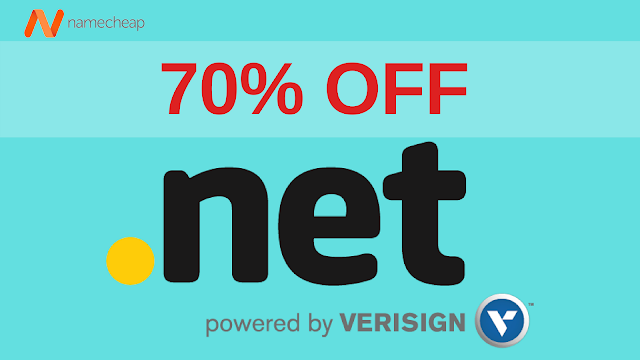 .NET – the second most popular top level domain after .COM domain is also going to be on sale tomorrow at Namecheap – up to 70% off. For three days only, from 9 to 11 May 2017, you can grab .NET domain for only $3.88/year (was $12.88). They didn’t announce about the number limited so I guess, we can buy unlimited .NET domains at this promo rate. Especially, for all successful purchased-domains, you will get one-year FREE WhoisGuard to protect your personal information. .NET domain for $3.88/year only. - Promo price is for the first year only, renew will be at $12.88/year. - PayPal and Credit Card accepted. For .COM domain name, Bigrock is offering the 1st year FREE when you purchase this extension for 2 years. In case you did not hear the news, there are many other good offers for .NET domain at the moment on Coupon33.com. Click here for more detail.